Two Upcoming Workshops- the same weekend! Bethany Gehman, M.Ed, a sexuality educator, provides sexuality education for people of all ages, conducts professional training, and promotes inclusive and comprehensive sexual health education in Deaf K-12 educational programs and interpreting settings. Unpacking Sexuality: Bringing Unconscious Bias to the Forefront. 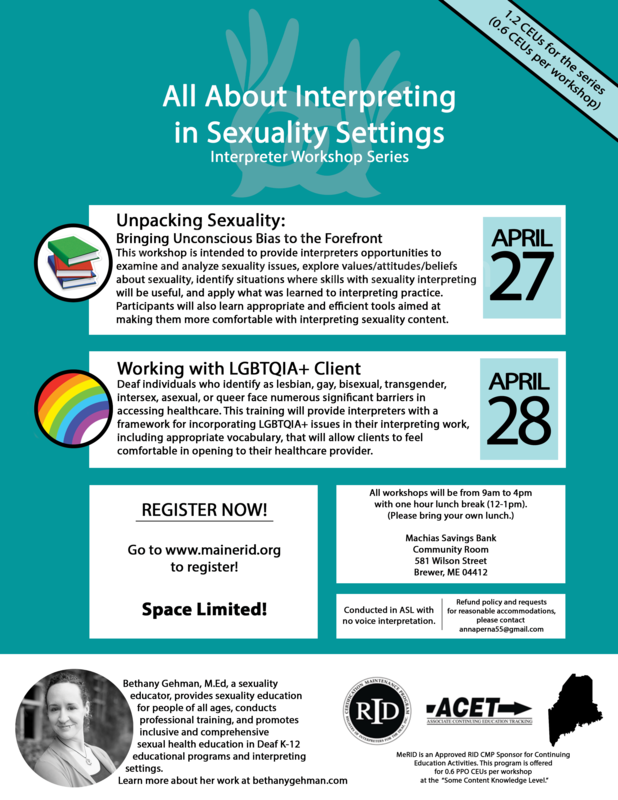 This workshop is intended to provide interpreters opportunities to examine and analyze sexuality issues, explore values/attitudes/beliefs about sexuality, identify situations where skills with sexuality interpreting will be useful, and apply what was learned to interpreting practice. Participants will also learn appropriate and efficient tools aimed at making them more comfortable with interpreting sexuality content. Deaf individuals who identify as lesbian, gay, bisexual, transgender, intersex, asexual, or queer face numerous significant barriers in accessing healthcare. This training will provide interpreters with a framework for incorporating LGBTQIA+ issues in their interpreting work, including appropriate vocabulary, that will allow clients to feel comfortable in opening to their healthcare provider. This workshop will be held in ASL only. All workshops will be from 9am to 4pm with a one hour lunch break from 12 to 1pm. Lunch will not be provided, so please prepare by packing your own lunch or viewing eateries near the workshop location. To learn more about Bethany Gehman- go to bethanygehman.com! Refund policy and requests for reasonable accommodations, please contact annaperna55@gmail.com. I am testing this comment section. I wonder who this comment will go to. I am looking at our revised website theme that Nate Lawson just installed and it seems to be working well! When I click the link -To Register: Click Here!! – I am connected to an opportunity to sign up for Survey Monkey Free, nothing more. No registration form, or means to get to it becomes available.